"Women are witches. Fighting for their men. Tansy was a witch. She was guarding you. But you made her stop." Here I am with the last book required by the Witches & Witchcraft Reading Challenge for 2017. I have more on tap, but for book number 20 I wanted something special. For this I wanted a book that has been on my list for as long as I can remember. I was going to use this for #1, but #20 is just as good. 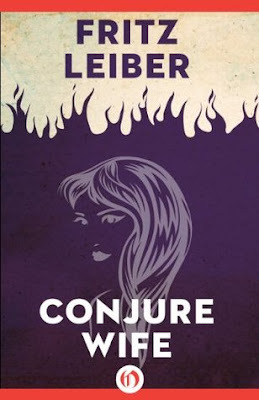 Fritz Leiber's "Conjure Wife" from 1943 has been held up as sort of a prototype of the modern American Witch tale. Seemingly normal wives in a small East Coast town married to normal, rational men of science and academia turn out to be powerful witches engaged in a silent secret war of magic. The book is a bit a dated in terms of what the roles of men and women are/were, but at the same time, it is also still very, very engaging. At first, I didn't think I'd like it due to the casual misogyny in the tale, but the story soon gripped me and once I reminded myself that this was the 1940s AND some roles were over emphasized on purpose. We were not just supposed to believe that these women were quiet, dutiful wives because it was the 40s. It was also the mask they wore to hide the fact that they were everything BUT that. They were intelligent (more so than their husbands), clever and some down right evil and all were powerful. By the end of the book, you are left feeling that the men in this tale are really no more than children, a bit dim ones at that. Leiber is a masterful storyteller and Conjure Wife is no exception. There are some great plot twists and turns and his characters are well developed. Norman and Tansy are likable characters and very easy to relate to. It is no wonder that he is featured so prominently in both AD&D's Appendix N and the "Suggested Readings" in Moldvay's Basic D&D. The book was made into a movie three times. "Weird Woman" (1944), "Burn Witch Burn (1962)/Night of the Eagle", and " Witches' Brew" (1979). Of the lot "Burn Witch Burn" was the best if I remember right. I have them all on tape somewhere. This book is available in multiple formats and covers. It is a true classic. Witches in this book: 4, none or millions. Are they Good Witches or Bad Witches: Tansy is a good witch. The other three, not so much. Best RPG to Emulate it: Something modern would work nicely. Certainly Chill or Call of Cthulhu might work well. Use in WotWQ: The modern setting is less suited for the faux-medieval setting I am looking for in War of the Witch Queens, but Tansy certainly fits the bill as a witch queen. The idea of every woman having some sort of power in secret would make for a lot of fun in a game. That old chestnut of a normal cat being more powerful than a first level magic-user becomes scary when you think who might be controlling those cats.